With the beginning of the earnings season this week FactSet reported that in the first quarter analyst lowered earnings-per-share estimates by 7.2%, the largest decline since 2016 Q1. One of their main fears is that the record rise in wages which has outpaced the PCE for the previous quarters, may lead to lower margins especially for labor-intensive companies. However economic data for US were positive: ISM manufacturing PMI exceeded forecasts at 54.5, while the ISM non manufacturing index was lower than expected but still indicated a robust expansion. The week ended with the Labour Department report which was well above forecasts after a weak performance in February: the non-farm payrolls increased at 196,000 versus forecasts of 175,000, with an unemployment rate at 3.8%, close to last year’s record low of 3.7%. Moreover, wage growth has slowed down compared to last month with hourly earnings growth at 3.2% which is suggesting that inflation will remain low. Consequently, this report was welcomed by markets as on the one side it set aside fears coming from the weak February report, and on the other low inflation figure confirms the Fed won’t probably raise rates. As a result of these positive economic data markets entered in a “risk-off mode” as US stock indexes generally rose while Treasuries declined, the Yield curve turned positive (for the 3 month and 10 year) and the probability of a rate cut declined. The S&P 500 ended the week at 2,892.74 up 1.55%, the DJIA rose at 26,424.99 up 1.33%, the Nasdaq Composite closed at 7,938.69 up 1.78%; instead the 3 Month Yield rose at 2.420% and the 10 Year Yield closed at 2.494%. Interestingly volatility on interest rates, as measured by the MOVE index, has been rising while the VIX index has been slightly declining; this implies that there may be fears about interest rates movements from the Fed. The dollar index closed at 97.36 rising 0.08%. Oil prices climbed at $63.26 recording a 5.12% rise. Finally, gold ended the week at $1,295.90 with a slight loss of 0.08%. On Thursday Tesla Q1 deliveries were substantially lower than estimates, the company attributed this to logistical problems due to its first deliveries of the Model 3 in Europe and China; but analysts are also worried about the slowdown in Model S and X deliveries. Tesla shares ended the week down by 3.41%. UK manufacturing PMI has risen to its 13 month-high but mainly driven by an increase in inventories as companies prepare for a No-Deal Brexit, as proven by the sharpe decline in the order to inventories ratio. On Thursday the Markit services PMI was below 50 signaling a contraction, and the Composite Output index had the worst quarter since 2012 Q4, thus signaling weakness in UK domestic demand. On Tuesday the House of Commons voted for four alternatives to Theresa May’s deal, none was able to win a majority. As Theresa May recognized that the MP’s would not support her deal, she held talks with Labour leader Jeremy Corbyn, but on Friday these talks seemed on the verge of collapse. The incoming week will probably be fundamental for Brexit as the Parliament will held more indicative votes to find where is the majority. As a result of this uncertainty the GDP-USD was quite volatile during the week initially rising by about 1%, but then closing on Friday largely unchanged at 1.3036 recording a 0.01% increase. The yield on the 10 year Gilt increased by 12 basis points at 1.117% while the FTSE 100 rose by 2.3% at 7,446.87. Germany services PMI suggested that domestic demand remains strong however both the manufacturing and composite PMI are at record lows; moreover factory orders decreased by 4.2% compared to last month, while markets where expecting a modest rise. This data are evidence of a slowdown mainly driven by external demand which for the moment is balanced by strong internal demand; Markit surveys are showing a divergence between PMI services and manufacturing employment which may signal weakness in the labour market. A divergence between manufacturing and service activity is evident in the entire Eurozone as Markit surveys have recorded lower than expected levels of industrial activity but a resilient domestic economy. Indeed, on Wednesday European retail sales beat expectations, further signaling that the relative strength of the domestic economy is balancing the global weakness reflected in industrial activity. A notable outlier was Spain where PMI services expansion was strong and manufacturing PMI slightly recovered from its recent lows; for this reason Spain turned out to be one of the main contributor to Eurozone growth in the last quarter. The EUR-USD was unchanged during the week closing at 1.1218. The yield of the 10 Year German Bund rose by 8 basis points and turned positive to 0.011%, and the yield of the Italian 10 Year BTP was unchanged closing at 2.478%. Despite some weakness in data European equity markets were largely positive during the week probably driven by a renewed confidence in Chinese economy, and by the strength of the Eurozone domestic economy. The Eurostoxx 50 closed at 3,447.47 up by 2.86%. The Financial Times on Thursday reported that Unicredit may bid for Commerzbank should the current talks with Deutsche Bank falter. The Italian lender would probably integrate Commerzbank with its German branch HypoVereinsbank. 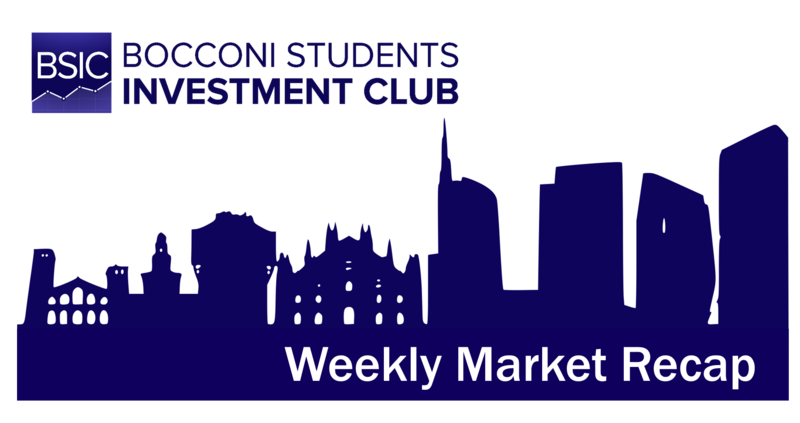 As a result, both companies’ shares spiked: Unicredit ended the week at 12.03 up by 3.74%, and Commerzbank closed at 7.53 up by 8.27%. Monday’s Chinese official manufacturing PMI and Markit’s one were higher than expected. However, it is extremely difficult to interpret data from the first quarter in China due to the shifting dates of the Chinese Lunar New Year holidays. This year holidays were relatively early begging the 5th of February pointing at a weak February and to a stronger March. In addition to this, even if Chinese central bank has reduced multiple times reserve requirements for banks, easing monetary policy, the supply of credit is still limited and borrowing costs for small-medium size companies remain high looking at the current yields in the bond market. This is mainly because monetary authorities are looking forward to enhancing growth but also reducing financial risk, thus limiting the scope of the monetary stimulus. A positive sign is that according to the Financial Times, US and Chinese officials have resolved most of the issues concerning their trade disputes and a resolution is coming. As a result, the Hang Seng HSI ended the week at 29,936.32 rising by 4.04% and the Shanghai Composite closed at 3,246.57 up by 8.40%. The Turkish economy is stabilizing: both the PMI and the output index recovered from their recent lows. Meanwhile core CPI has been slowing to about 17.5% from a peak of about 24% a few months ago. However, the electoral defeat of Erdogan’s ruling party, the AKP, in the local elections of Istanbul and Ankara, added to the president’s woes. In particular, at a time where an international crisis with the US and an economic crisis at home require strong economic reforms to restore market’s confidence in the country, this defeat may limit their scope. As a result, the USDTRY was very volatile this week but overall closed at 5.63, with Lira down by 0.78% over the week, while the BIST 100 (the main stock market index) rose by 5.33% closing at 98,783.36. Japan Nikkei 225 rose by 2.84% during the week closing at 21,807.50, while the 10 Year Bond yield increased by 6 basis points ending at -0.030%.